A look at the property prior to starting the project. 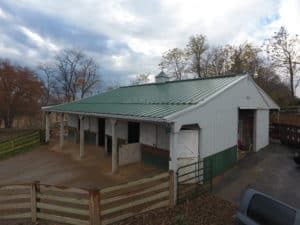 Paul and Caroline Ritchie of Middletown, Maryland came to Quarry View in 2016 to discuss renovating the existing horse barn they had on their property. The main purpose of the renovation was to update the barn to complement their home and the rest of the property. After being recommended to us by their friends and our former customers, they decided to trust us for this project. The Ritchies had several issues with the current barn that needed to be resolved. The existing exterior was quite drab and the loft was inconvenient and caused the rest of the barn to be dusty and dirty. We began the renovation in November of 2016. The end goal was to create a beautiful and unique structure that fit within the Ritchies’ budget. To accomplish this goal, we reused and refinished the previous stall partitions and matched them with customized European stall fronts that allow people to feed the horses through the stall without opening the door. To help fix their issue with the hay storage, we created space for it in a lean-to outside the building. We also removed the loft space and installed a natural finish tongue and groove cathedral ceiling. 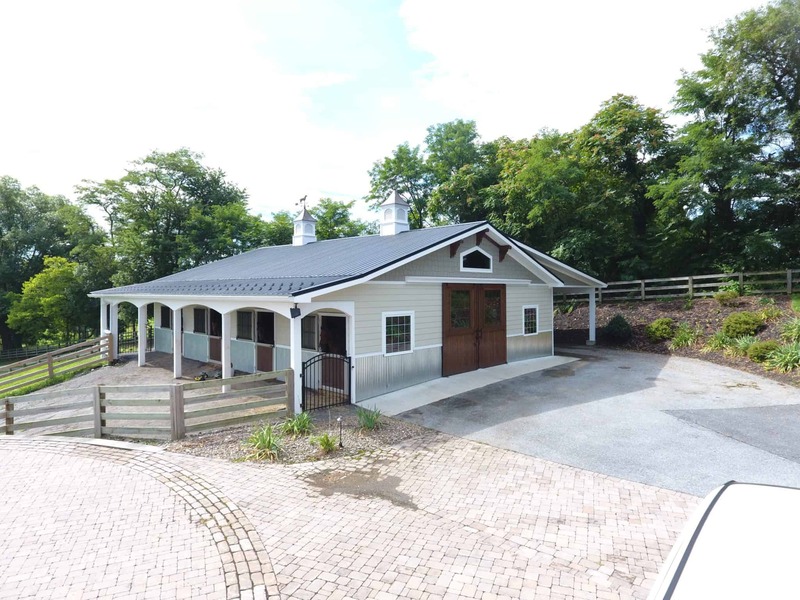 As another practical feature of the barn, we insulated the entire building to help regulate the temperature and keep the horses comfortable in both summer and winter. We removed all of the existing siding and roofing. We then installed a new metal roof with two copper roofed cupolas, fiber cement siding that matched the house, and a galvanized metal wainscot. We replaced the existing sliding doors with natural Western Red Cedar doors. Some timber accents at the gable peaks added a nice finishing touch. A look at the building after construction. In January of 2017, After two months of hard work, the Ritchies were left with an attractive 2,300 square-foot barn and a 900 square-foot hay storage. Paul and Caroline were ecstatic with their finished barn and told us it was exactly what they had envisioned. If you’re looking to renovate your existing horse barn or start from scratch, reach out to us today! We would love to work with you and help you determine what features will best suit your needs!